Preheat oven to 400ºF. Cut spaghetti squash in half, and scoop out and discard seeds. Spray the center of both halves of squash with cooking spray, and place cut side up on a cookie sheet. Roast until tender when pierced with a knife, about 50 minutes. Meanwhile, line a baking sheet with aluminum foil and place a cooling rack on top (the rack is optional but will help drain fat). Heat olive oil in a skillet over low heat. Add the onion, and sweat for several minutes until translucent and then turn the heat up to medium. Add the garlic, red pepper flakes, and dried oregano; cook for another minute or two; and remove from heat. Allow to cool slightly. Remove casing from sausage, and discard. In a large bowl, add the onion mixture, ground beef, sausage, egg, almond meal, and salt. Mix together with your hands. Gently form 2-ounce meatballs. Do not overwork the mixture, or the meatballs will be tough. Place on the prepared baking sheet, and dollop a tablespoon of marinara sauce on to each meatball. Use a pastry brush to cover each meatball. Cook in the oven for 20 to 23 minutes, or until the internal temperature reads 165ºF on an instant read thermometer. 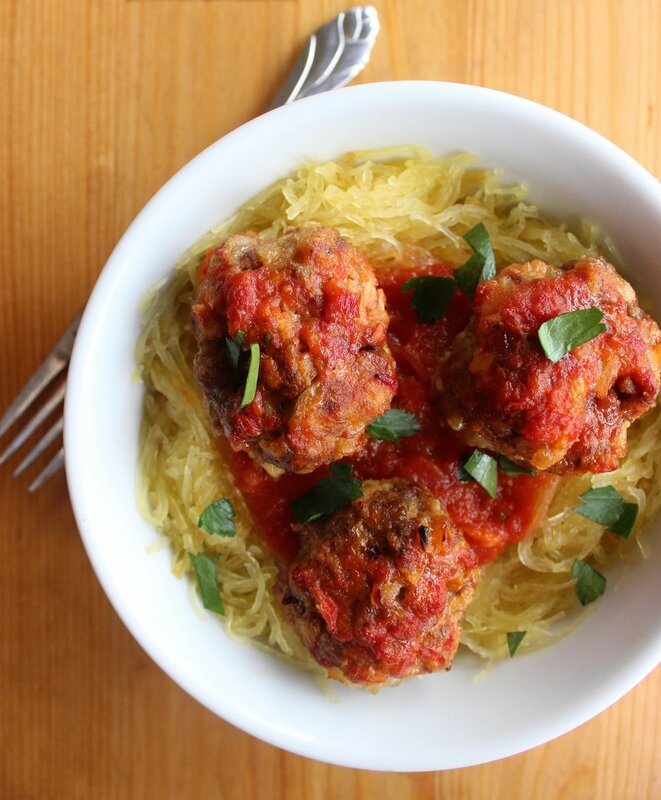 Remove the spaghetti squash from the oven, and scoop out the squash's flesh into bowls. Then remove your meatballs, top off with additional marinara sauce, and garnish with parsley.